Infographic of the Day: Can Charts Throw Light on Shakespeare? Hey, interface designers: Keep your algorithms off our literature! Understanding Shakespeare sounds like the perfect antidote to the un-bookish ways of an entire generation raised on LCD screens and Leo DiCaprio’s Romeo. Billed as a “new form of reading,” it’s a data visualization project that turns Shakespeare’s prose into language Web addicts are supposed to be able to comprehend: algorithms, data maps, and the like. The problem: We can’t grasp one damn lick of it. Understanding Shakespeare is the bachelor’s thesis of Stephan Thiel, an interface-design grad from the University of Applied Sciences Potsdam. He isn’t the first to turn the principles of information design on literature and fail. People love visualizing the Bible, even though it turns an already complex text into complete gobbledygook. (Yay, more ambiguity people can start wars over!) The interface designer and professor Boris Müller stuffed the entirety of Faust into a single poster, but most of the words are so small you can’t make out what they say. And British designer Stefanie Posavec must’ve spent hours throwing together this incomprehensible map of On the Road — which is weirdly appropriate since the book reads like it was written by a 8-year-old hopped up on Adderall. 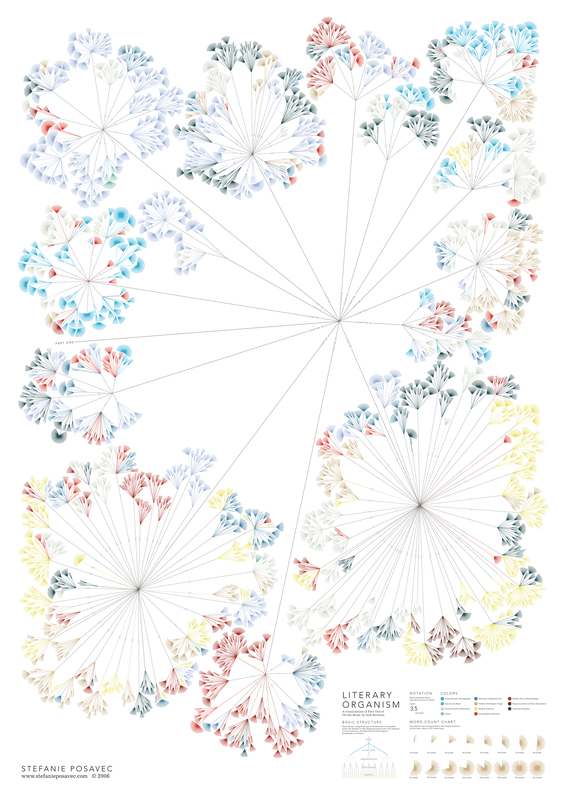 The visualizations are beautiful, there’s no doubt about that –Thiel’s Shakespeare project included. But information design isn’t just about aesthetics; it has to, well, inform, too. And where literature’s concerned, the only way to do that is to crack open a book.